My shop update will be tomorrow afternoon, so if you're in the market for some cuteness, please drop by! There will be magnetic pin cushions, knitting bags, kits, and toys. It doesn't sound like much, but I've spent the last few weeks working on everything. Today was spent taking photos for the listings, so here is a sneak peek at everything. I don't have any more books to add the to update, but if anyone really wants one, you can get them here. My husband has also been super busy working on a booklet of Easter patterns. It is available for sale in my Lulu shop, although this is really meant for yarn shops. I'm hoping to get enough wholesale orders to be able to make more booklets in the future. We got one printed to see what they're like, and I really love how it turned out! It's such a nice size, and seems like it will last for many uses. I wish we could have colour pictures inside too, but it was really too expensive. So now you know where most of my knitting time has gone lately! 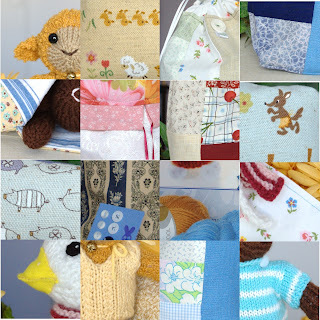 I'm planning to make a new toy for every pattern and keep them this time, in case we need more pictures in the future. I am still thinking about the cow pattern, and how to get it to look the way I want. It's much harder than I thought, I suppose because cows really don't look like teddy bears. I also have a bunch of toys to make for Mahar Dry Goods, so I won't have much extra knitting time in the next 4 weeks. I hope you all can be patient. I really want to do the best job I can, and sometimes this takes more time than I expected. Posted by Barbara Prime at 3:43 p.m.
Barbara - Thank you for the intriguing "collage" of photos! I hope all goes well for you with such a busy schedule!! I look forward to anything you come up with - I still like the cow you knitted last year!!! Happy Knitting and don't wear yourself out!! Good Luck !! January 17, 2008 at 4:33 p.m.
January 17, 2008 at 7:14 p.m.